Payments can be made by both cash and card in this facility, but there are no congestion charge machines available. The facility is under 24 hour CCTV surveillance ensuring that your vehicle is being looked after; however, it is not advisable to leave any valuables on display as security is not guaranteed. There is only one passenger lift available, which seems inadequate for a facility of this size and scale of operation, and there are no bays allocated for blue-badge holders. If you are visiting this area, the London Victoria car park is definitely a convenient place to park in, especially with two other car parks around the corner which you can fall back to if you find it full. Additionally, if you’re commuting to work in this area in your own vehicle it would be a wiser choice to get a contract space via ParkingLocal. 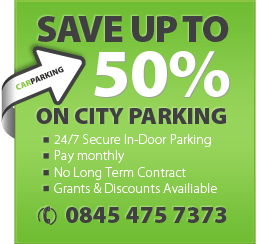 We guarantee that you will save over 50% by opting for our parking solutions. « “Parking Fine” – compliment or con?